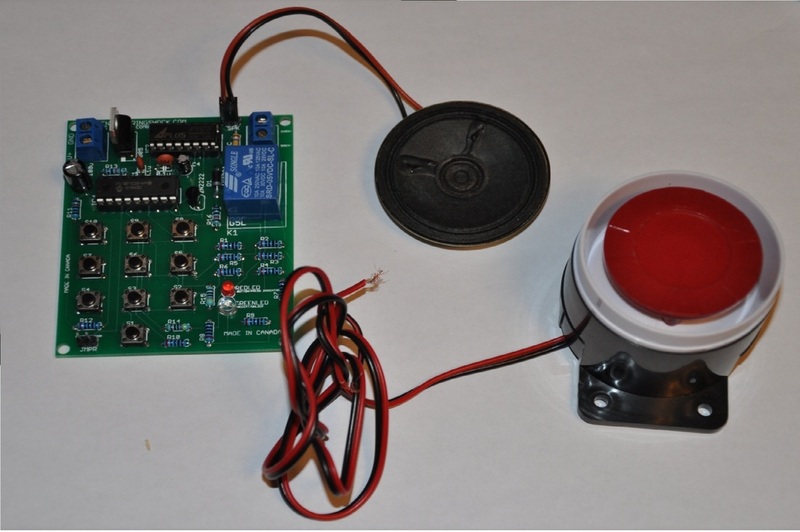 This listing is for a fully assembled and tested talking combination lock module with siren. It acts as a panic alarm system. The above video offers a full demonstration of some of the applications. We will also be selling this kit with an electromagnetic solenoid in place of the siren, but not in this listing. Please watch the above video carefully, and read the information below. This device is used essentially as a custom panic alarm. It has a default combination feature, and a custom combination feature. This is talked about more below. The above video offers you a full demonstration of how this device works. We also offer this in DIY kit form for a few dollars less, so make sure to have a look through our store! Please note that while the video above may say that an AC adapter will be included, it DOES NOT. Please see below for details relative to purchasing an AC adapter that works with this set. The device comes with a plug-in 1/4W speaker that instructs the user how to operate the device. For instance, if you power the device up in default programming mode, the device will say "Default Combination", then "System Ready". If the user powers the device up in custom combination mode, the device will say "Enter Combination". When a four digit combination is entered, the device will say "System Ready". When the device says "System Ready", It means that the unit is waiting for the user to enter the correct combination. If the user enters in an incorrect combination, the system will say "Incorrect Combination". If the user enters in the correct combination, the unit will say "System Activated", and the green "Active" LED will turn on. In addition, the on board relay will turn on, and the siren will blare. The user must then press any button, and let go before the relay/siren are turned off. At which point the system will say "System Deactivated", and then "System Ready", indicating that it is now waiting for the correct combination again.